Shaw Hardwood Flooring offers consumers the timeless tradition of hardwood flooring with a wide variety of species, colors, and sizes. ManningElegance engineered for superior performance. Engineered Hardwood flooring is real hardwood - the word “engineered” just refers to the way in which it’s made. And there are many benefits to choosing an engineered product over a solid product. Mohawk Hardwood Floors offers handcrafted beauty and exceptional quality by using the finest hardwoods and the exclusive CrystalShield™ finish. Available as Solid Wood Floors or Engineered Wood Floors. Whether you choose the floating or stick-down option, WICANDERS floors are quicker and easier to install than ever before. With the improved CORKLOC-design and increased sizes of the stick-down range, a WICANDERS floor saves time and reduces installation expense. It’s true. EnCore Plus® floors are harder, denser, more dimensionally stable, and tougher—all attributes of a floor that is more forgiving. Wood flooring is timeless. It enhances the warmth of any home and complements the decor of any room. 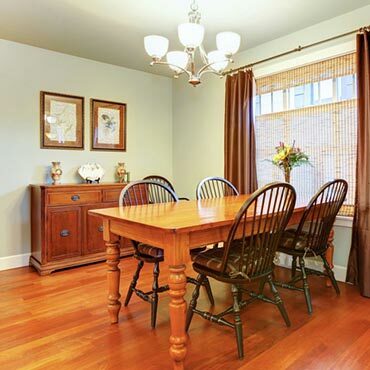 Like a fine piece of furniture, wood flooring increases in value and becomes more beautiful with time. In a national survey, 90 percent of real estate agents said that houses with wood flooring sell faster and for more money. Wood is a natural resource, renewable and recyclable. Buildings, barns, ships and other structures made of wood often find a second life in wood flooring, cabinets, walls and ceilings. And leading allergists agree that wood floors are the perfect choice for a healthy home. The state-of-the-art technology and almost limitless choices of today's stains, finishes, styles and designs make wood flooring one of the most practical, easy-care and versatile floor coverings today. Maintained properly, wood flooring should never have to be replaced. At Ameri-FLOORS we believe an educated consumer is our best customer.